Emma Reidy investigated whether emojis are evolving into a unique language by asking college students to translate the pictograms into words, then translate sentences into emojis, looking for consistency in their usage. Take heart, 45-year-olds who have no idea what that string of skulls or pandas means in a text. Emory College senior Emma Reidy has discovered that college students don’t really agree on what emojis mean, either. The prospect of emoji emerging as a new type of language appeared to gain momentum after Oxford Dictionary selected an emoji as the 2015 Word of the Year. Officially called the Face With Tears of Joy, the emoji accounted for nearly 20 percent of all emoji use in the United States and United Kingdom. It also prompted incredulity in laymen and linguists alike on emoji as language. After all, regular thumb typers sometimes used the emoji to convey sadness, since the small image sometimes just appeared as a crying face. In linguistic quarters, there were purist arguments over the need for syntax and grammar to decode language. Reidy was ripe for the debate. 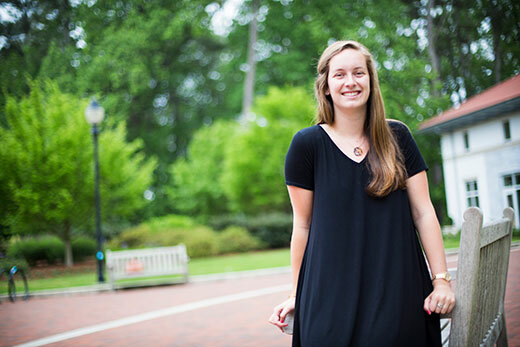 She had arrived at Emory thinking of an international studies degree when an introductory linguistics course altered her path. She became fascinated by the cultural prejudices in languages, studying not only what people say but how they say it. Anyone who has ever taken an online quiz asking if they say “sneakers” or “tennis shoes” for athletic footwear, or use “buggy” or “shopping cart” at the store, know the fun of such study. For Reidy, though, it went even further: She saw how linguistic formations could affect housing and job discrimination. She also experienced one of those snap judgments based on language when she studied abroad. Reidy had been studying and speaking Spanish since she was 4 years old. But that comfort with the language didn’t help when she thought her hosts in Spain were related to pretty much everyone in town for their use of "tio" — uncle — when introducing people to her. Turns out, the use translated to just “man.” No relations required. Being deliberate about learning came in handy for Reidy’s thesis. As administrative director of Emory Miracle and an Emory admissions fellow, she and friends used the little emotive pictures regularly. But she still was certain use didn’t make emojis language. How to prove it? Her idea — after reading hundreds of pages of linguistic theory and debate on the combination of syntax and semantics — was to find a sample of college-aged, regular users of emojis. Emory was fertile ground for that. She gave study participants a lengthy questionnaire that first had more than 50 emojis on the Apple keyboard. She then had them translate a string of only emojis into that string of words we call sentences. Finally, she took known sentences — “I would like a bottle of wine, please” and “To be or not to be, that is the question” — and had participants create the emoji equivalent. True, the heavy emoji users created entirely different pictograph sentences when translating her sentences. But her analysis showed that the study users also couldn’t agree on the meaning of single emojis. Given Apple has a limited amount of images, such open-ended use would be somewhat expected. After all, that peach could be a fruit or a tush, right? Even more curious, the same user ended up deciding to use an emoji they had already defined — for example, the flushed face to mean shocked — for an entirely different meaning, such as being flirty or coy. Linguistics program director Susan Tamasi thinks Reidy has discovered something new in her research. Emoji may have effectively killed off the common netspeak — why LOL when you can post a toothy face, after all — but it is likely more suited to improving written communication than becoming a language of its own. Rarely do text messages contain just a string of the pictographs. They are used in conversation with written language and can be a new way to add punctuation. With hilarious and disastrous miscommunications all too common over email and text, emoji may be what conveys the tone and intonation of spoken language. Reidy still uses emoji with friends in Gamma Phi Beta and elsewhere. But her focus now is on heading to Argentina on a Fulbright teaching award. After that will come graduate school in applied linguistics, or English as a Second Language and a possible career teaching. Still, she may be called on to help translate emoji. The prospect of several skull emojis? Here at Emory, that’s clearly Dooley. “Emojis still work well to communicate what you already know in context,” Reidy says.